If you’re searching for a slightly larger watch, the Kano fits the bill. At 44mm wide, the stainless steel case is on the larger side, but given the 12.9mm case thickness, the proportions are well-balanced. That said, while I like the watch quite a bit at 44mm, I think if they shrunk it down to 40-42mm it would be perfect. Regardless, the 44mm case fits well on a 7″ wrist. You’ll find a screw-down crown on the side at 3:00, and a mineral crystal up top. The Kano is rated for 200m of water resistance — more than enough for water activities. 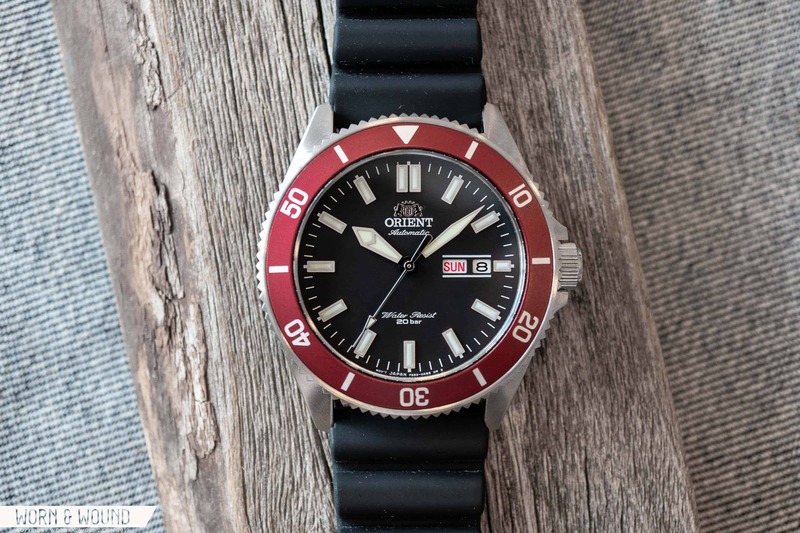 Orient is particularly proud of their case finishing on this model. The Kano features highly polished sides and a brushed top along the lugs, which transforms the look of the watch depending on the angle from which you’re viewing it. The 120-click unidirectional bezel has a matte insert with alternating hashmarks and numerals, and there are sharp teeth running around the side of the bezel for extra grip. The teeth look more like a coin edge than the scalloped execution found on Orient’s other divers, and I like that the detailing here is more subtle when viewing the watch from above. The machining also looks quality here. Orient’s choice in typeface for the bezel numerals is blockier and less stylistic than others in their lineup, and on the Kano it really works. The dial is relatively straightforward, but there’s a neat little detail worthy of note. The day/date at 3:00 isn’t fully framed, but there are lines above and below the aperture, which give the dial a unique flourish that is strangely appealing. The handset’s design is classic and clean. The hour and minute hands are sword-shaped. Inside the shorter hour hand is an angled step that adds a bit of visual flair without being distracting or garish. You can choose from three handsome colorways: blue dial with blue bezel, black dial with red bezel, and a classic black dial with black bezel. Each of the models have a different finish on the dial, too. There’s a light sunburst on the blue, gloss on the black/black, and matte on the black/red. Inside the watch is Orient’s F6922 automatic movement. 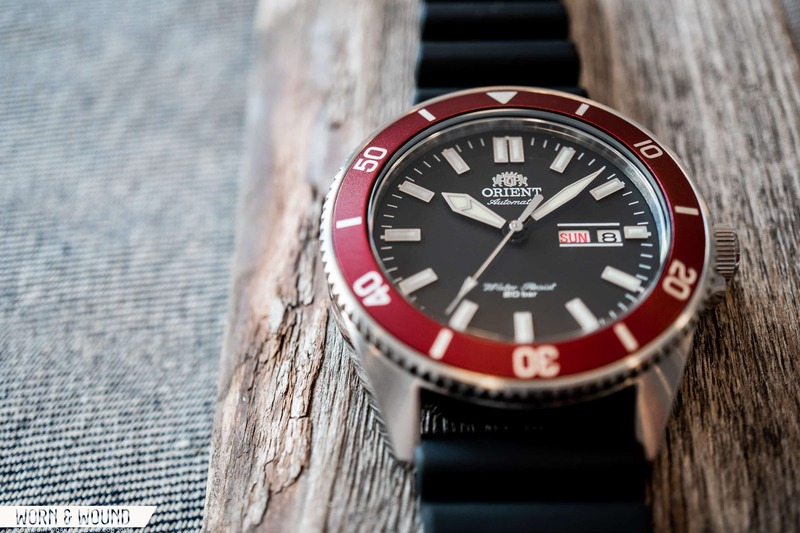 This is the same movement that’s in their more expensive Mako range, and it has features that aren’t typically found in a watch in this price range. The F6922 has hacking seconds, it can be hand-wound, and it has 40 hours of power reserve. Ed is a Long Island-based writer and photographer with an affinity for watches, fountain pens, EDC gear, and a great cup of coffee. He’s always looking for the best gear for the job—whether it be new watch, pen, flashlight, knife, or wallet. Ed enjoys writing because it’s an awesome (and fulfilling) way to interact with those who share the same interests.